Kristelle was invited for the second round of ‘The Voice‘ project by the 1st Russian TV Channel. It will take place in Moscow on July 2, 2013, starting from 11 a.m. and till 10 p.m. 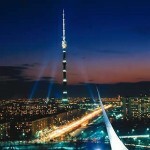 Casting will have a format of a ‘live’ listening and will take place in the Ostankino Tower in the center of Moscow. We wish Kristelle good luck!